Wise Food Storage Review: The Best Emergency Food Storage Service? More and more people are looking into survival preparedness by stocking up on all the essentials you could need in case of an emergency situation. If you’re in that same boat, Wise Food Storage is a company you’ll definitely want to look into. They provide their customers with survival food kits that contain freeze-dried and dehydrated foods to help you survive in the event of an emergency. You can stock up on entrees to ensure you have food no matter what catastrophe strikes. To find out what you can expect with their products, we’re sharing tips on placing your first order, what kind of meals you can expect, and even how to store everything properly. To get started, you’ll want to head over to the Wise Food Storage website to place your order. It’s not like a standard meal delivery service that sends you fresh food on a subscription basis. Instead, you’re able to order whatever food you want, as often as you want. You’re in complete control of every order you place without being locked into any kind of subscription. If you’re someone who is just getting into survival and emergency food preparedness, you might want to take a look at their starter kits. This will help you begin stocking up on freeze-dried and dehydrated meals to start building your food stash. You’ll discover options for breakfast, lunch, dinner, and even a food/drink combo. You have the option to purchase based on how much food you’d like to have, whether you want a 72-hour supply for two people or even a one-week supply. If you’re looking for a “grab and go” option, they have survival backpacks with both 5-day and 2-week food kits. Each option provides enough items for one person, but gives you all the must-haves you’d need in an emergency situation. We found this to be an incredibly useful item to have in case their was ever a hurricane or any other natural disaster that might displace you from your home. The one down side to their “kits” is that you aren’t able to select the items you receive. You can, however, see which meals are included so you’ll always know exactly what you’re getting. 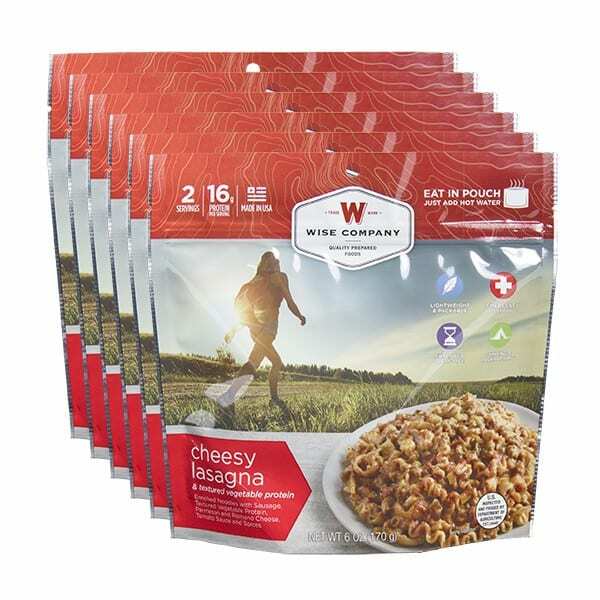 For example, their Emergency Freeze-Dried Entree Bucket with 60 servings contains meals such as: Cheesy Lasagna, Pasta Alfredo, Chili Macaroni, Chicken Noodle Soup, and a Baked Potato Casserole. If you’re a picky eater, you may want to go a la carte by creating your own food survival kit using their Outdoor Food options. When placing your order, you can also sort kits based on what you might be looking to stock up on. You can find freeze-dried meat, milk, eggs, fruits, and vegetables. They even have gluten-free and organic options for you to consider. In addition to all of the emergency food kits, Wise Food Storage also provides options for water storage, filtration, and power storage. This makes it a good one-stop-shop for getting yourself ready for an emergency. You can also order kits of freeze-dried powdered eggs if you like to have eggs in the morning. After all, there’s no reason you can’t stock your emergency kit with some of your favorite dishes. Just because the meals are made with freeze-dried and dehydrated ingredients, it doesn’t mean they have to be bland after all! For something to drink, they offer freeze-dried powdered whey milk. It has a 20-year shelf life and the milk needs to be rehydrated by simply doing water. In just minutes, you can have a refreshing glass of milk to drink with your breakfast dish. You’ll find this is included with some of the kits, but you can also purchase it individually. The meat kits typically include rice as well, which makes for the perfect pairing. You can also order packs of freeze-dried fruits like strawberries, bananas, and peaches. They also provide vegetable kits that contain corn, peas, broccoli, and green beans. These kits also come complete with sauces you can use to add to your veggies. Full nutrition facts can be found for each meal if you’re curious about the ingredients and nutritional value of what you’re eating. You can actually view all of this information directly on the Wise Food Storage website for easy access. Once your order from Wise Food Storage has shipped, you will receive a shipping confirmation email that contains delivery times. They don’t leave you guessing about when your order will be shipped. You can expect your order to be delivered either by FedEx or LTL carriers. There’s also no need to be home in order to receive the package because a signature is not required. The carrier who makes the final delivery will leave the package for you. So, even if you can’t be home, you can feel reassured knowing that your package is safe and sound and waiting for you at home. Our Wise Food Storage order was delivered to us within the week of us ordering it. The meals themselves are packaged in airtight Mylar pouches to provide maximum protection for your food. The barrier film that’s used to create the packages is called Metallyte, which is a metalized oriented polypropylene. This is just a fancy way of saying that this specialty packaging keeps the food as insulated and protected from spoiling as possible. It provides a barrier to oxygen, flavors, and aromas, which can cause bacteria to grow and ruin the food. To prepare your order, those pouches are then arranged in a durable, polyethylene bucket for efficient storage. You can easily stash it away in your basement and you’ll never have to worry about it taking up too much space. If you purchase more than one bucket, they are actually lock-in stacking buckets, which provides secure storage. There are also grab-and-go handles, which makes them easy to transport if needed. Compared to other food storage companies we’ve researched, Wise Food does a great job of keeping their food as protected and spoil-free as possible. When dealing with freeze-dried and dehydrated foods, you might be wondering just how fresh the entrees are. Well, according to Wise Food Storage, studies have shown that freeze-dried and dehydrated foods will last up to 25 years or possibly even longer if stored properly. To ensure the life of your food, you’ll want to keep everything in a cool, dry place with room temperatures of 50 to 55 degrees. A basement would be an ideal place for storage. As long as you’re storing your food properly, you really don’t have anything to worry about in terms of freshness. When you do decide to open up one of their entrees and prepare it. The best part is meal prep is not as intensive as it would be with a regular meal. The majority of their meals are basically pre-made and only need to be warmed up or have hot water added to them in order to be eaten. To be honest, the taste isn’t that bad (especially considering that it’s emergency food). The pasta sample we reviewed in our YouTube video actually tasted like a decent pasta dish. This is due to the fact that they’ve used a combination of freeze-dried and dehydrated ingredients to help the food maintain its original flavor, shape, color, and texture. This also allows the food to better retain its nutritional value, so you’re still getting the vitamins, nutrients, and macros you need on a daily basis. As mentioned above, preparing your freeze-dried and dehydrated food is pretty simple. Typically, each individual serving requires just one cup of water. Although you can use any temperature of water, hot water will help speed up the “cooking” process. We’ve tried making their meals with hot, cold, and lukewarm water. They cook and taste best when hot water is used. According to Wise Food Storage, certain ingredients set-up and taste better when freeze-dried, while others are better when dehydrated. For example, they’ve found that vegetables, fruits, and meats are best freeze-dried. For this reason, they use a combination of both to ensure the food is nutritious and still tastes great. As mentioned above, the pasta sample we reviewed in our video was actually much better than we expected it to be. Many of the dehydrated and freeze-dried foods we’ve tried in the past have taste very salty. They make you want to chug water right after. 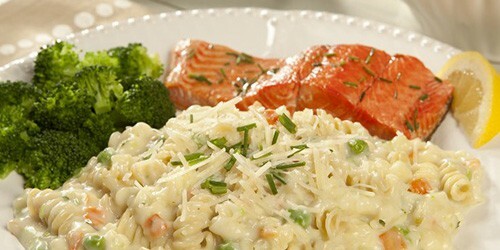 However, the pasta wasn’t loaded with too much sodium so it didn’t taste overly salty. When it comes to pricing, it’s all going to depend on what you choose to order. To begin stocking up on freeze-dried and dehydrated food essentials, you can go with one of the Starter Kits. The most affordable option is the 52 Servings of Wise Freeze-Dried Emergency Food and Drink Storage. This kit comes with four different entrees, two different breakfasts, the Orange Delight Drink Mix and the Whey Milk Alternative. You’ll receive this kit for $89.99. For other starter kits that contain more servings, you’re looking at prices upwards of $100. How much you spend is really dependent on what you want to buy and how much of a stockpile you’re trying to build. There’s actually a food storage calculator on their website which will help you determine what your family actually needs before placing an order. This will help you ensure you purchase plenty of food for storage without going overboard or worse, not getting enough. If for any reason you are dissatisfied with your purchase, you can return the merchandise you’ve ordered, no questions asked. Items will need to be sent back within 90 days of your purchase date in order to be accepted. All you have to do is call Wise Food Storage or send them an email to begin initiating the return process. There are two important aspects to building an emergency food stockpile. First, you want to make sure that the food lasts. It does you no good if the packaging is sub-par and the food is spoiled when you’re in an emergency. Second, you want the food to have real nutritional value. Your body needs to have vitamins and nutrients or you could wear out quickly in a stress-filled catastrophic situation. Based on our review, Wise Food Storage has great packaging and nutritional value. In addition, they go above and beyond with their return policy. If you’re not satisfied, return it for a refund! Lastly, it’s good to see that they use premium ingredients that come from the United States. There are tons of emergency food companies out there. Some may not tell you outright but they order their food from overseas, where the food and packaging regulations are completely different than those in the USA. You probably don’t want to take that risk when it comes to food storage. 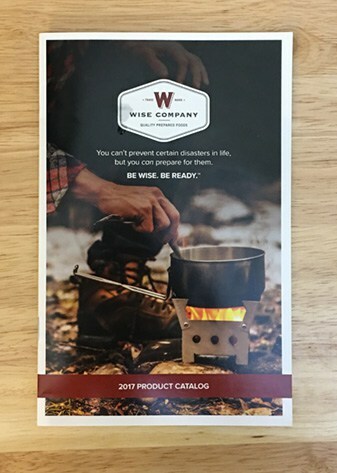 If you’re looking to get started with survival and emergency food preparedness, Wise Food Storage is a great company choose.